Its a known fact that Retail participation in Stock market have been dwindling for retail investors. Added to this, retail investors have badly burnt their hands by investing in over-priced Initial Public Offers (IPOs). Sai Silks (Kalamandir) Limited, is coming with its IPO with “Safety Net Scheme”. The Safety Net Feature is still under discussion and still not been made mandatory by SEBI. But this is a good move by a small company and should encourage retail participation in their IPO. Also retail investors would have a safety net. Given that their issue price might be Rs. 75 per share, it might not be bad idea to bid for 1,000 shares. The only loss you can expect is the opportunity cost and the loss of interest for 6 months, while the upside is unlimited. 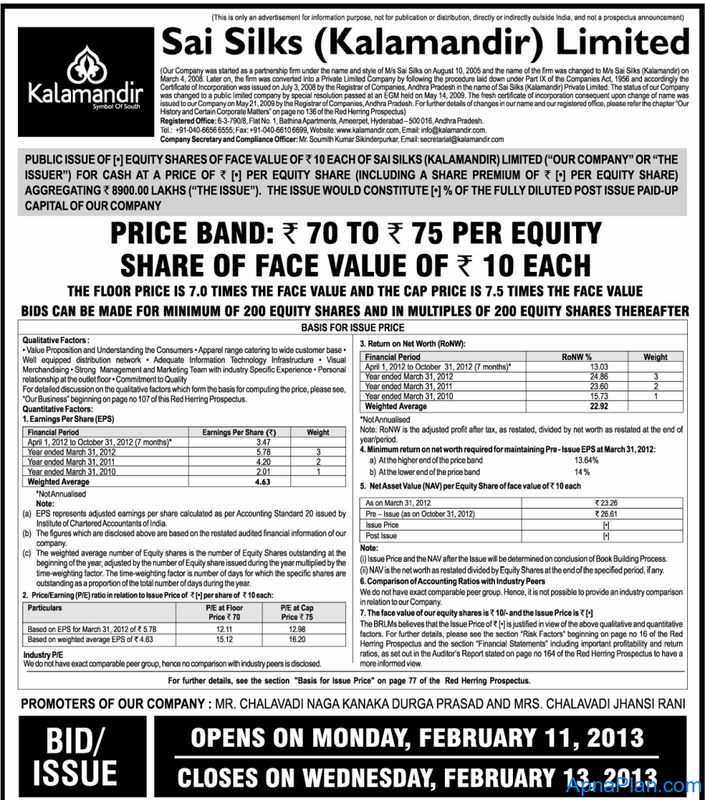 The Sai Silks (Kalamandir) Ltd IPO would open from February 11 – 13, 2013. The core business of the firm is retailing of saris, women dress materials, men and kids wear, and sales of gold and silver jewellery. The company has 15 retail outlets across Hyderabad, Guntur, Vijayawada, Bangalore, Kanchipuram and Hanumakonda with cumulative spread of over 1.29 lakh sq feet. Would you invest in this IPO? 10.4% Kosamattam Finance Ltd NCD – Aug’17 – Should you Invest? 10.4% Kosamattam Finance Ltd NCD – Apr’17 – Should you Invest? The voluntary safety net feature of the IPO is a welcome gesture. However, I also agree with your reply to an earlier comment that one should not make an investment decision solely based on the safety net mechanism. In fact, I will go one step further and say that running a company on sound ethical and financially prudent principles and then offering the shares at a fair value to the public is the real safety net. For the first time, I heard about this clause in an IPO. Thank you for highlighting this for public awareness. You recommend retail investors to invest in Kalamandir IPO? I don’t recommend the IPO solely on safety net. Its no doubt a good feature but the fundamentals and business of company is most important. So look into them before you take the decision of investing in Sai Silks IPO.